Social Progress Credit (SPC) monetize organizations’ social achievements in currency credits so we could exchange these credits that can be sold and bought in the market. If SPC works, we can monetise companies’ social values in currency values, and the government certify this as tax credits. Thus, companies can exchange tax credits, and it will appear as cash flows in the market: social resources. If a social enterprise can leverage this in creating social values, SPC will benefit these social enterprises in economic terms. There are three principles about the definition of social performances; performance directly achieved through business, performance not recognized by the market system, value-added performance compared to the best alternative available. Q) Any detail of social progress credit? All our business projects vary so we approached a case by case. Our annual routine is that firstly every year June ~ July, we send out official letters to social emprises and social start-ups. 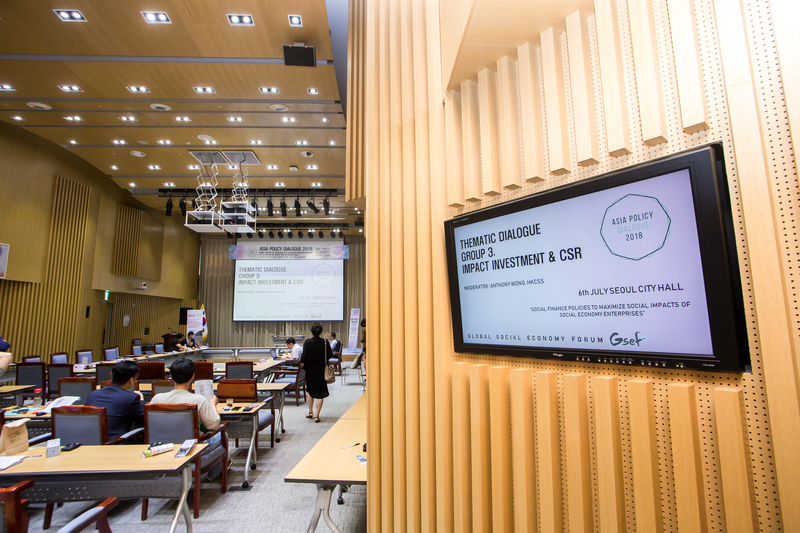 Our minimum criteria are companies have at least 2billion Korean won revenues and have social missions. For three years, competition rates were 3~4:1, and due to the limit in our fund, we could not select too many. We asked all companies to apply for the funding with a description of their social missions and submission of their financial statements. Then we invited professionals for the selection process and reviewed each company’s social mission. We go through this process until August than during September and October; we met each shortlisted company individually to agree on what type of indicators shall be used to evaluate their social values and their efforts of resolving social issues. It took us two years to reach an agreement with 44 companies by 2015. The first year, we firstly went through the process representative companies, and after gaining know-hows, the process got shortened from three months to two months. Social value measurement indicators are not simply given; it takes discussions between social value incentive operation members and CEOs. After measuring companies, it requires the review process. Around February, companies shall upload data for each indicator with their financial statements of the previous year. Then we review the data in March, and we arrange the data during April. In May we finally provide a fund to selected companies. Q) How to encourage those organizations and it’s like rewarding the social value by cash. Do you think they grew up business because they want to get money or grow business? If we don’t design mechanism and only need money will be different. How do you select such social price and make the fund concrete, so they will get no money or will be kicked out from the project? This differs from what the government’s funding, some companies use the funding to increase the welfare of employees and incentivize them; also there are companies utilise the funding as investments. There was a company that provides care services for elders, CEO of the company considered how much social values they could create if they increase the number of beds. We expect social start-ups to operate with more strategic plans like this case.